JERUSALEM (JTA) — At least 21 people were injured in a bus bombing in Jerusalem, police said, in the first such attack in Israel in years. A city bus exploded and went up in flames Monday evening on a major thoroughfare in the southern end of the capital. The blast set a second bus and a car nearby on fire. Two people were seriously injured in the attack, with seven moderately injured and 12 lightly injured. 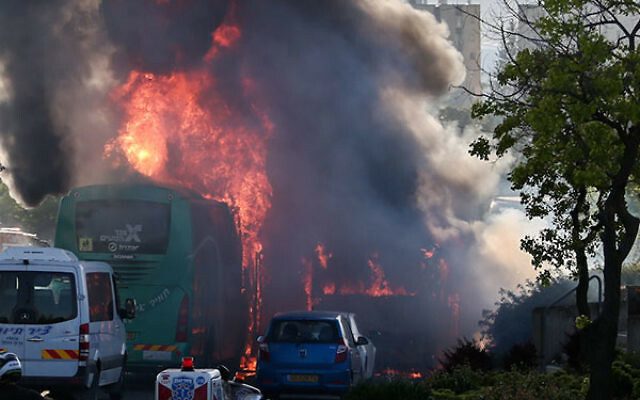 An explosive device was planted in the rear half of the bus, which was stopped on the major thoroughfare at the time of the explosion, according to the Israel Police. Police are examining the possibility that a suicide bomber committed the attack and was among the injured. The newly married 25-year-old, who was on his way home after a day at work, received burns on his face, arms and legs. Two hours later, Or Bondy was entering a CT machine barely able to talk. The explosion engulfed the nearly empty bus in flames. The flames scorched an adjacent bus, as well as a nearby car. A large fire raged at the intersection and sent smoke billowing into the air. At Hadassah Medical Center, Ein Kerem, seven of the victims were hospitalized. Three were anesthetized and receiving oxygen. The victims had burns on their upper bodies, as well as wounds from nails and ball bearings packed into the explosive device. The wounds, according to Avi Rivkind, head of Hadassah’s trauma unit, were similar to those from previous Jerusalem terror attacks. The attack follows a six-month wave of stabbing and shooting attacks in Jerusalem, the West Bank and across Israel. The rate of those attacks had declined to normal levels, though Israeli officials remained concerned about a flare-up in violence surrounding upcoming religious holidays, including Passover. Israel experienced a wave of bus bombings during the second intifada in the early 2000s. The bombings killed hundreds of people and deterred many Israelis from riding buses. Bus bombings declined following an Israeli military operation in the West Bank and the construction of Israel’s West Bank security barrier. In recent years, most Palestinian terror attacks come in the form of either stabbings, shootings or car rammings at public transit stops. Deputy Jerusalem Police spokesman Assi Aharoni said the police were hunting for suspects and urged the public to be alert.